KENT ISLAND'S ARCHAEOLOGICAL TREASURES AND WHAT THEY TELL US. Archeologist Dr. Darrin Lowery talks with locals about historic artifacts from Kent Island during the 2017 Kent Island Day celebration. Noted archaeologist, Dr. Darrin Lowery, shared his experience, insight, and some of his artifacts at his presentation entitled “Kent Island’s Archaeological Treasures and What They Tell Us” recently on Wednesday, March 20, at 7:00 p.m. at the Historic Christ Church in Stevensville. The presentation was well attended filling the church to capacity. Dr. Lowery will be in attendance at the 2019 Kent Island Day Saturday May 18 so bring your artifacts or look at his displays! On Thursday January 17, 2019 from 4 p.m. to 9 p.m. 20% of each meal purchase at the Kent Island IHOP (300 Abruzzi Dr, Chester, MD 21619) was donated to the Kent Island Heritage Society! Thanks for helping us continue our efforts to discover, identify, restore, and preserve the heritage of Kent Island for future generations. Two topics will be discussed at this event. New information on William Claiborne and the implications and a discussion of the results of the latest grant completed on the Narrows and stories from that. County Historian Mary Margaret Revell Goodwin will be presenting the new information based on her research, and Gigi Windley of the Kent Narrows Development Foundation will present on the Narrows details. The event is sponsored by the Kennard Alumni Association and Stories of the Chesapeake Heritage Area. Oyster roasts and fish fries are a long-standing tradition that celebrates the bounty of the Chesapeake region. Guests will feast on pit beef and fried oysters by Paul Gunther, and fish fried by local fry master Melvin Shorter - all while supporting programs to preserve, promote, and interpret the Eastern Shore's cultural, natural, and historic resources. Oysters on the half shell from Harris's and a local dessert bar will also be available for purchase. Tickets cost $40 if and can be purchased online. 2018 FALL PICNIC - Cancelled! Although the weather has interfered with some of our outdoor activities this year we have have been plenty busy and there is still lots to explore and learn about Kent Island heritage! Historic sites are still open the first Saturday of October and November, our annual Brunch is December 9, and we will be visiting Kent Island schools to present unique educational experiences related to Kent Island history! Much, much more is happening so visit our Facebook, Twitter, and website often to learn what is happening! Each year the Kent Island Heritage Society (KIHS) hosts a Fall Picnic for Members and guests at the historic Kirwan Farm! Our Old Fashioned Picnic is free to Members and their guests.The Society provides fried chicken, hot dogs, iced tea, lemonade, games, entertainment and coffee. Bring your lawn chair, a covered dish to share and join us for hay rides, corn hole, genealogists, children's games, music, a 50/50 raffle, demonstrations and displays. 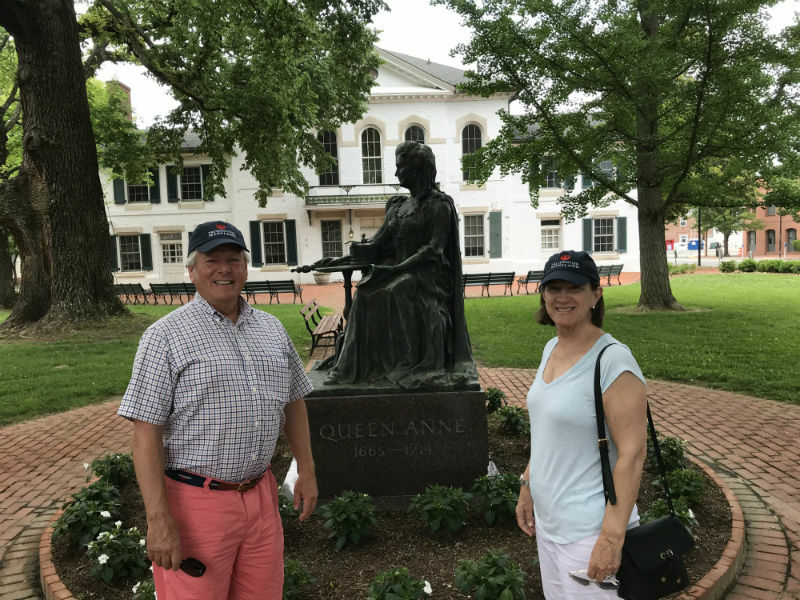 What a great idea this couple (Diane and Jeff Caslow) had to learn the history of our land and people! Jeff Caslow with our very own Linda Collier, curator of the Kirwan House! Select this LINK to read the Spotlight article covering our March 2018 Bay Bridge meeting held at the Historic Christ Church in Stevensville, MD. Congratulations to Kylie DeVincentz, graduating senior at Kent Island High School #kentislandhighschool! She will be attending the University of Calgary in the Fall! We wish Kylie the best in her academic studies and her future endeavors! Deadline is April 30 of the year the scholarship is awarded. For more information regarding the 2019 scholarship please contact Nancy Cook, 124 Bryce Road Queenstown, MD 21658 410-758-2505. Annual Kent Island Heritage Society Members Chester River Dinner Cruise Aboard the "Chester River Packet". 5:00 p.m. to 8 p.m. Note: "A great time was had by all"! Kent Island Day 2018 may have been cancelled due to rain but our spirit is not dampened! 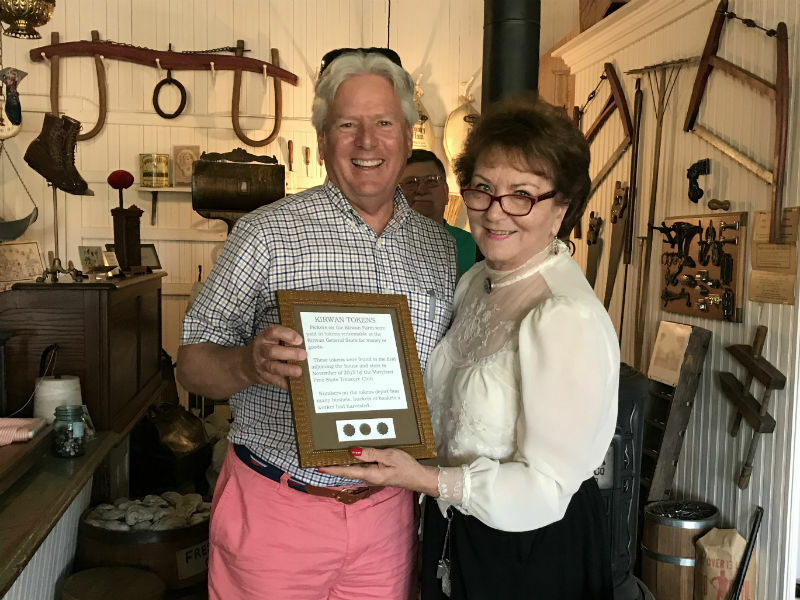 We are looking forward to other events this year for members and guests such as the Chester River Packet cruise and the Fall Picnic at the Kirwan House and Museum. We will continue to provide special tours of our historic properties for interested groups; fun and informative educational sessions to schools and civic groups; and First Saturdays (first Saturday of the month) docent-lead open houses of our historic properties in Historic Downtown Stevensville and the Kirwan House/General Store/Museum in nearby Chester. support of Kent Island Day. Please check our website, Facebook, and Twitter regularly for updates and don't forget we house a large collection of Kent Island history and genealogy materials at the Kent Island Library. 2018 Kent Island Day Cancelled! Due to several days of rain we had to cancel the 2018 Kent Island Day. Unfortunately no rain date is available. However, we are already planing for Kent Island Day 2019!! Check our website for updates and events; follow us on Twitter, Pinterest, and Facebook; and, of course, consider becoming a member or benefactor of our great organization! Thanks to all that attended the presentation on Wednesday March 28, 2018! Get ready for Kent Island Day and visit us First Saturdays at our historic sites! Manns Woodward Studio formally presented the most popular plan (~12,220 sq ft) to the County Commissioners Tuesday, February 13, 2018. The total cost of the project is estimated to be between 6-8 million dollars. Support for the much needed expansion is not in question but how to pay for it. Please let your Commissioner know we need the expansion and the inclusion of our Local History Room! Watch the presentation here starting at the 144:20 mark. NEW!!! Library Expansion FAQs! Don't forget to support our Kent Island Heritage Society History Room in the new plans! Board member, Linda Collier, was recently inducted into the prestigious Maryland Senior Citizens Hall of Fame 2017. Those of you that have had the pleasure to meet or work with Linda find her youthful enthusiasm and energy contagious! We are truly blessed to have her as a member of our board. She is currently the curator of the Kirwan House and Museum. You can read more about the James E. Kirwan House under the Historic Sites tab and The Maryland Senior Citizens Hall of Fame here. CURATORSHIP OF HISTORIC SITE IS FILLED! The Historic Christ Church Rectory (ca.1840 -1855) has a new curator! Please check back to learn about future renovations and activities.